Christmas greetings from Japan. With the end of the year fast approaching, we wanted to share with you some of the things that we are thankful for since our last newsletter. BAPTISM- In mid-September, Yukako Yamasaki was baptized at SIBC. This was a great blessing in two ways. First, it is good to see Yukako embracing her new faith in Jesus Christ. She has a real desire to serve the Lord and be used by him. Also, this was our first baptism celebration since moving to our new building, and it gave the church a bit of a much needed spiritual boost. Please continue to pray for her spiritual growth. More pictures can be seen here. THE LAST SUPPER- In the Fall, Michael began a preaching series on the Last Supper. As we have been studying Jesus’ final evening with his disciples (John 13-17) we have been challenged by the life that Jesus outlined for his disciples after he was gone. The call to remain in him and to continue the ministry that he started has created a hunger in our hearts for more of Jesus and a desire to do the work of the Kingdom. Please pray that the Holy Spirit help us to grow in both of these areas. BBQ/HIKING- In November, we had our annual BBQ and hiking outreach event. The weather was perfect as about 50 people joined us for a day of food, games, singing and hiking. 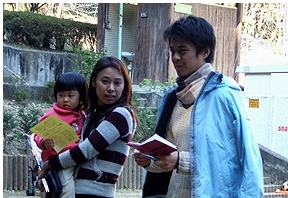 Hiro Kanayama also shared a wonderful testimony of how he came to faith in Jesus Christ. Please pray that the seeds that were planted would produce much spiritual fruit. NEW PEOPLE- We have had a number of new visitors to our worship service in the last few months. When your church is only 25-30 people, a few extra people can really make a difference! Most of these people have found us through our internet homepage, which shows us the value of this wonderful tool. Please pray that God would provide someone who could update and maintain our church’s website. Please also pray that theses many new folks would soon feel connected to our church family. CHRISTMAS CONCERT- On Dec. 9th, we had an outreach Christmas Concert. 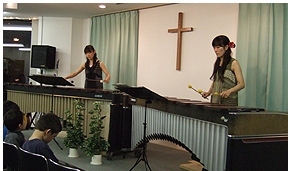 As our musical guest, the church invited twin sisters who both played the marimba. Though the turnout was a little smaller than we were hoping for, everyone who came was very blessed by the music. There were also a number of people who heard the message of the birth of our Savior for the very first time. Please pray that these people would grow in their desire to know more about Jesus. LUKE’S SCHOOL- Since Luke started 1st grade at Kansai Christian School (KCS) in the Fall, we have really enjoyed being a part of the school community. Chris helps with the PTA, volunteers in the school office, and has had a chance to pray with many of the mothers. Michael helps one of the other fathers lead worship at the monthly chapel time and also serves on a committee to help the school find a new facility (the school’s current rented facility is being consumed by termites!) By the way, Luke likes the school too and is involved in the drama club. VACATION- Around Thanksgiving time, we had the chance to take our first family vacation in over a year. 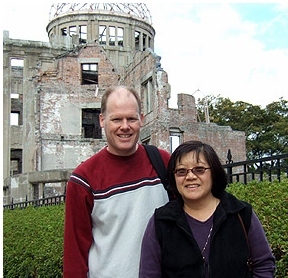 We took a short trip down to the Hiroshima and Miyajima area of Western Japan. It was nice to get away (even if it was only for three days), and Luke was really interested in learning about the atomic bomb. See a few more pictures here. CHRISTMAS TREE- This might seem a little silly, but we are thankful for our new Christmas tree. After moving from an apartment to a house in May, we finally have room for a “real size” tree. So, after 11 years of celebrating Christmas with an 18-inch tree on top of our TV, we finally have a tree that is big enough to actually fit presents under! YOU- Finally, we are thankful for all of you. Thank you for your support, cards, letters, gifts, phone calls, prayers and e-mails over the year. As we look back on 2007, this has truly been a good year for the Mason family. May the Lord bless you all in 2008!